The California Vision Foundation (CVF) is a non-profit, optometric charity designed to provide low-income and uninsured families throughout the state of California with free comprehensive eye exams and low cost glasses. One in five non elderly Californians – approximately 6.3 million children and adults – lack health insurance. California’s own Los Angeles County has some of the worst rates of uninsured in the nation with a total of 2.2 million people lacking health care coverage. Originally it was Vision USA and was a part of the AOA. But after changing to the California Vision Foundation, COA took control of operations and started to provide examinations year-round. 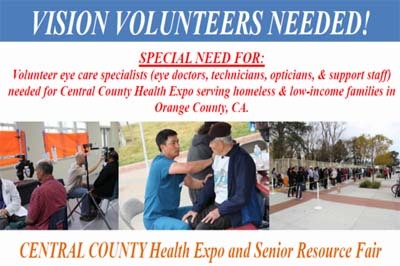 Volunteer eye care specialists (eye doctors, technicians, opticians & support staff) are needed for the Central County Health Expo serving the homeless & low-income families in OC. We need 10-15 Optometrists. If we can’t get volunteers, we will have to turn away thousands of seniors, adults and children. We need your HELP ! !